A volcanic eruption occurs when hot materials from the earth's interior are thrown out of a volcano. Lava, rocks, dust, and gas compounds are some of these "ejecta". 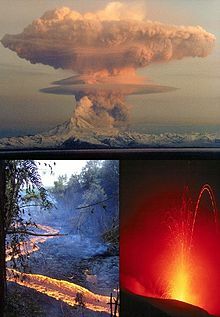 Eruptions can come from side branches or from the top of the volcano. Some eruptions are terrible explosions that throw out huge amounts of rock and volcanic ash and kill many people. Some are quiet outflows of hot lava. Several more complex types of volcanic eruptions have been described by volcanologists. These are often named after famous volcanoes where that type of eruption has been seen. Some volcanoes may show only one type of eruption during a period of activity, while others may show a range of types in a series. The volcanic explosivity index (commonly shortened VEI) is a scale, from 0 to 8, for measuring the strength of eruptions. It is used by the Smithsonian Institution's Global Volcanism Program in assessing the impact of historic and prehistoric lava flows. It operates in a way similar to the Richter scale for earthquakes, in that each interval in value represents a tenfold increasing in magnitude (it is logarithmic). Most volcanic eruptions are of VEIs between 0 and 2. This page was last changed on 17 April 2019, at 17:06.